Gain Instant Access To Our Extensive List Of Cash Flow Properties Available Right Now! Get the best deals on rental properties in your area before your competition, and even before local real estate agents, know that they're for sale! Through our massive network of motivated sellers, we have access to hundreds of rental properties being sold at the lowest prices in the marketplace. When you join our Investors Hot List, you'll be the first to get access to those properties AND you'll receive your FREE copy of our brand new report, "5 Ways to Increase Your NET Rental Income by $300 per Month or More per House." Get your copy: "5 Ways to Increase Your NET Rental Income by $300 per Month or More per House"
Find Your Next Cash Flow Property Here! Complete this form to be added to our Investor Hot List and receive rental properties for sale in your area. 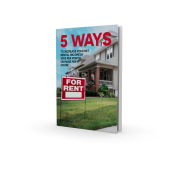 PLUS get your FREE copy of our brand new report with 5 ways to increase your rental income.